having both lights and electric heaters. This Trolley, which served its namesake towns of Shelburne Falls and Colrain for 30 years until 1928, has never left this valley and spent 20 years of its life crossing the Deerfield River on the bridge now known throughout the world as the “Bridge Of Flowers”. After the Trolley Company failed in 1928, Trolley No. 10 was saved by the Johnson family of Colrain and it served various uses over the next 65 years and was then donated to the museum in 1992. After a complete restoration, No. 10 was returned to operation on October 9, 1999 amid a gala festival to honor the trolley, its donor, and the many volunteers and professional people who helped to make an impossible dream a reality. This year, at the beginning of Trolleyfest, at 11am, there will be a Ribbon Cutting Ceremony to celebratethe museum’s New Carbarn, which is now housing No. 10 , replacing her former wooden shed. The new metal Carbarn also has a second stall which will now allow museum volunteers to do more work throughout the year restoring other parts of its collection . The ribbon cutting ceremony will honor all the donors who have given both financially and with professional services to make this project a reality, and the many volunteers who spent countless hours to see this project come to completion. 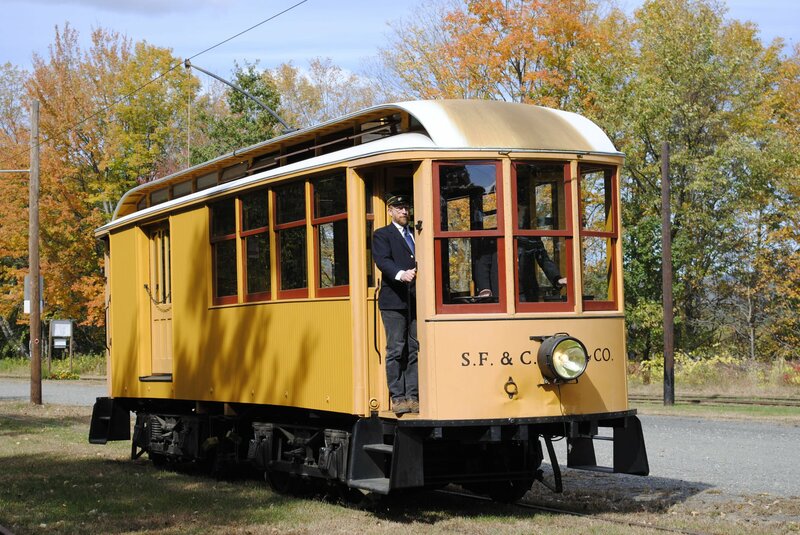 Visitors this year will be able to ride not only Trolley No 10 and the pump car, both of which are available any time the museum is open, but also will be able to ride the caboose, which will be powered by a trackmobile, and also a Speeder, often referred to a s a Motorcar or Putt-Putt. Wooden and electric trains will be available for the youngsters. At 2:30, there will be a reading by the author of “The Little Yellow Trolley Car”. There will be music during the afternoon, and from 1 to 4 pm trolley era reenactors will be riding the trolley. Starting at noontime until 4pm, there will be hands-on demonstrations of Cider Making, Butter Making, Tool Making, and Weaving, which are all activities that relate to industries that were served by the trolley line. There will also be Blacksmithing Demonstrations. McCusker’s Market will be distributing samples of some of their products between noon and 3 pm and The “Scoop Shack” will have refreshments available throughout the day. The public is invited to share in the activities. All- Day Adult passes are $4.00 and Youth passes are only $2.00 with children under 6 being admitted free. Next Topic: Embark on a magical train ride and visit Santa Claus at his Workshop!